Perioperative nursing is the specialization which deals with those activities performed by registered nurses (RNs) in the preoperative, intraoperative, and postoperative phases of surgery. In addition to being called perioperative nurses, these RNs are also referred to as operating room nurses, OR nurses, and surgical nurses. These nurses are instrumental in planning, implementing, and evaluating treatment of surgical patients. They often work closely with the patient and their family as well as other health care professionals. As surgical care continues to evolve, so does their role as it relates to patient care in the operating room. Instrument or scrub nurses are perioperative nurses who work directly with surgeons within the sterile field. They select and pass the various instruments, sponges, and other supplies used during the procedure. Scrub nurses got their name because they are required to scrub their hands and arms with special disinfectants. Circulating nurses are perioperative nurses who assist with managing the nursing care throughout a patient’s surgery from outside the sterile field. Circulators are not required to scrub. An RN first assistant is a perioperative nurse that assists the surgeon throughout the surgery. This role requires additional training beyond that which is required to become a licensed RN. RN first assistants are responsible for reviewing the patient’s case prior to surgery. They assist with the preparation of the operating room for the procedure. RNFAs assist with positioning, preparing, and draping the patient. Once the operation begins they help with exposure, retraction, closure of the incision , and countless other technical duties between retraction and closure to assist the surgeon in completing a safe operation. There are many subspecialties from which surgical nurses can choose. Some include general surgery, trauma surgery, neurosurgery, cardiac surgery, plastic and reconstructive surgery, orthopedic surgery, oncology, and pediatrics. Perioperative nurses can also perform in other roles. They can become the director of an OR where they are responsible for managing operating room budgets, staffs, and other business. They can become clinical educators, researchers, management consultants, or medical salespersons. Many often go on to become nurse anesthetists. 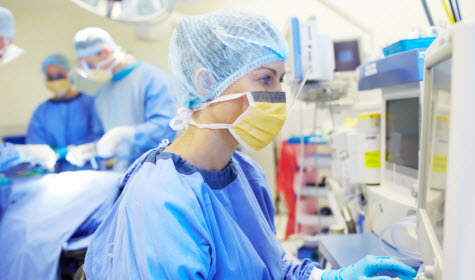 Perioperative nurses work in a variety of settings. While many work in hospital surgical departments, there are alternative settings where they are employed. Surgical nurses also work in outpatient or day-surgery units (also referred to as ambulatory surgery units), various types of clinics, as well as physicians’ offices. In order to work in an operating room in a perioperative nursing role, one must be a registered nurse. In order to become a registered nurse, students must first complete a Bachelor of Science in Nursing, Associate’s degree in nursing, or nursing diploma program. Alternatively, those who hold a Bachelor’s degree in a non-nursing discipline can complete an accelerated direct entry Master of Science in Nursing program. Upon successful completion of one of the above programs, students must pass the NCLEX licensing examination. Most hospitals and other medical facilities offer programs to prepare RNs to transition into becoming a perioperative nurse. Experience working in a critical care and/or emergency room setting can also help prepare you for a move into perioperative nursing.